Largest Die: 2.24 x 4.72 Inch, (57mm x 120mm). A Nine die set, in an elegant collection of high quality steel dies designed to co-ordinate with each other. 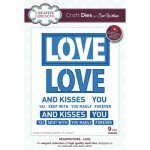 Creative Expressions Craft Dies can be used in most leading die cutting machines; Grand Calibur by Spellbinders, Cuttlebug by Provocraft, Big Shot by Sizzix and eBosser by Craftwell. Designed by Sue Wilson. Imported from UK.